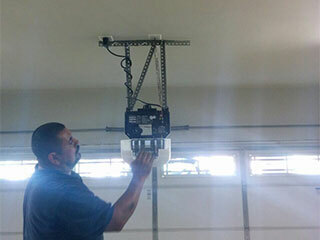 Your garage door opener is the device that allows your overhead door's operation to become automated. Many homeowners come to rely on the proper function of these units for the convenience of their daily routine, so when something goes wrong, repairing them becomes a major priority. Why it is important to repair your garage door opener? When your opener stops working correctly, your automatic garage door becomes dangerous. While it may not seem like it at a glance, we can assure you that trying to use the door while its opener is malfunctioning is a terrible idea. Anything from the safety sensors, which are in charge of preventing the door from closing on you to the drive system, which powers the door's operation, could be compromised, which means you can't be sure you or any of your family members won't be hurt. You need to avoid from using your garage door until the issue has been fixed by professional technicians. When your garage door opener is acting up, the security of your home can become compromised. If your opener won't allow your door to close properly, even the tiniest gap can be taken advantage of by would-be burglars. Even the opener's digital locking mechanism can't be relied on when some type of electrical - or even mechanical - issue is present. You need to make sure the circuit board is examined and the problem is resolved before you allow yourself to rest easily. Aside from safety and security being compromised, when your garage door opener is suffering from a problem, other parts of your door can become damaged as a result. Say the force or travel limits aren't properly adjusted, the door could end up slamming into the floor when trying to close, which can result in damaged panels. The rollers and cables, as well as the tracks, can also be damaged as a result, therefore getting the issue fixed as soon as impossible is important, otherwise more costly repairs will likely be involved. If your opener is starting to malfunction, contact our experts at Garage Door Repair Houston right away. Avoiding potential dangers and reducing the chance of future repairs are the main reasons why we offer emergency services. Call us today.